Last night, my beloved Cleveland Indians lost. I would even go so far as to say we blew it. 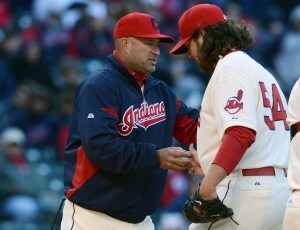 A very long game short, Chris Perez, our closer, didn't have it. Our lead was tossed out the window and a fantastic effort of Justin Masterson. What followed the game was painfully offensive and for the first time, I understood why players might not want to play in Cleveland. While watching the game, I followed it on social media as well. The venom spewed at Perez was mind numbing. He stepped on the mound and he was the Bull Pen hero. An hour later, people were challenging him to a fight and screaming for harm to come to him. People on twitter were posting to him calling him everything but a pitcher. The personal attacks were shocking. I get that when you jump on the Internet train you are exposing yourself to no shortage of anonymous trolls. People are amazingly vocal and tough from their basement couch. But, that doesn't make it right. Just because you can challenge someone to a duel, doesn't mean you should. The rule mom taught us, if you can't say something to someone's face, don't say it, is a good way to operate in your social media interactions. Make no mistake friends, if you want to criticize Perez for coming back to early, or something else about his performance, bring it. If you want to attack his manhood , his hair or threaten his health, please go somewhere else. Or, say it to his face. Is Age A Factor For Brandon Weeden? Who Has Klout In Cleveland?